Long before ‘The Best of Enemies’ was published (on sale today), movie producer Ron Howard and Imagine Entertainment optioned the book with an eye toward making a motion picture from the tale. It’s not hard to see why. ‘The Best of Enemies’ has all the elements that Hollywood loves. To start, it has two quirky and colorful lead characters, CIA Officer Jack ‘Cowboy’ Platt and KGB Officer Gennady Vasilenko. 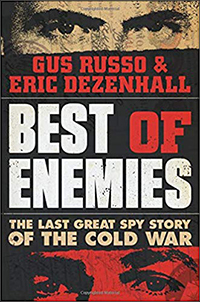 As the book’s title suggests, the men, on opposite sides of the Cold War, develop a deep, abiding and unlikely friendship that survived a brutal cold war and, at times, even more cruel peace at a time when a supposed warming of relations between their countries hid an icy resolve to expose traitors in their midst. In order to access the rest of this book review, you must be a spy or a Cipher Brief Level I member. You can prove your credentials via login or by signing up to become a Cipher Brief Member.